Southfacing, lowbank, oceanfront lot with well and septic installed; hydro to lot line. Adjacent to park with lovely sandy beach and common dock. 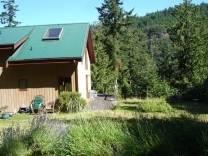 Enter this property on a paved driveway to discover a lovely natural setting of large arbutus trees and Douglas firs. This 2.48 acre property with 269 feet of high bank waterfront has stairs to access the sitting deck and the dock. A rare opportunity to own 5.34 acres of property in a completely private setting surrounded by Gulf Islands National Park on Saturna Island. Oceanfront, a priceless piece of paradise, where Orca whales play on your own "rubbing rocks" for a spectacular show below wrap around amphitheatre decks. Panoramic views South over the Boundary Pass to the San Juan Islands, Orkas Island, Waldron Ilsand, Stuart Island, Mt. Baker, and Sidney. Northern mediterranean microclimate. Vaulted ceilings, spacious open concept plan, many upgraded and high end features in this home. Gently sloping to ocean. Artist's and gardener's delight;1920's 3 bedroom, 1 bathroom character home with a hot tub and shower room. High bank water front with views of Lyall Harbour and a very short walking distance from ferry and stores. Spectacular ocean view lot overlooking White Rock, Georgia Strait and the Coast Mountains.